In attendance: Penny Marquette, Mary Anne Krejci, Patti Sinar, Gloria Doering, Mary Anne Slattery, Annette Brady, Rachel Luther, Karen Barta, Pam Reitz, Carolyn Balogh, Pat Witmer, Linda Littler, Kathleen Arthur, Cathy Parker, Eileen Simon, Claire Purdy, Bev Cinovec, Nancy Mazak, Pat Barb, and Joan Marsh. Guests: Elise Bennett and George Rader. Our guest speaker, Dee Dee O’Neil, spoke to us about bringing in some of your plants and caring for houseplants through the winter. She emphasized that before you bring a plant in, you should check the root ball to make sure that it’s healthy and give it some fresh potting soil mix without fertilizer. You should also be familiar with the origins of the plant so that you can care for it properly. For instance, a succulent has far different needs than a tropical plant. She suggested using the Google site “go native” to find information that will be helpful. Photosynthesis is the process of plants taking in carbon dioxide and water in the presence of light to create glucose molecules and give off oxygen. Houseplants do this best when the temperature is between 60-90 degrees. Plants get water through their roots and tiny root hairs. Excessive fertilizer burns the root hairs which eventually kills the plant. Using softened water cause much the same reaction because calcium is exchanged for sodium and also kills the plant. Do not use softened water and water only when the plant is truly dry. Remember to check the plant by lifting the pot because it will be lighter when dried out. If you add 3 cups of water to a 6-inch pot, you are adding one and a half pounds to the dry weight of about four pounds. If you are watering orchids or succulents, it is best to have the pots on a raised surface so that water can drain through. The plants should be watered thoroughly, preferably in the morning. Fertilizer should only be applied to plants with healthy roots. Usually a half dose will be enough. Use a balanced fertilizer, 20-20-20 or 15-16-17. Because winter light from windows is limited, growth slows down and usually the plants go dormant. They should not be fertilized during this time, usually Nov. – Feb. The exception to this is if artificial light is added on a consistent basis. Light is important for growth. On a sunny summer day, plants outside get about 10,000 foot-candles while on a cloudy winter day, they get 500-2000 foot-candles. Inside, by a sunny window in the winter, the plants get only 200 foot-candles. They need to be exposed to this for 6-8 hours a day. A good rule of thumb is that if an area is bright enough to read in without a lamp, then the plant will get enough light. Plants do best in temperatures that are 60-75 degrees (up to 90 degrees for tropical plants). Pots that are on the ground will be 5-10 degrees cooler than what the thermostat says. Pruning plants back for their dormancy period is a good idea. This lets the roots grow and that helps develop a stronger plant. Some leaves may turn yellow but this is usually normal. Boston Ferns can be very messy plants because it is hard to thoroughly water the plant. Ms. O’Neil suggested taking the plant out of the pot, cut the foliage back by 90%. Use a long knife to slice the root ball in two and remove about 1 inch from the sides and bottom. Then re-pot the plant into two containers. Don’t be afraid to prune plants drastically. a. Too hot or too cold? b. Too wet or too dry? c. Too bright or too shady? d. Is it due to seasonal changes? e. Are there damaged branches? g. Are insects infesting plant? Check plants when you bring them indoors and treat them with soapy water if necessary. Be sure to check them periodically by looking under the leaves and at the axils where the leaves attach to the stem. If you see a cottony mass, you have mealy bugs. Aphids in their adult stages are hard shelled and resistant to the soapy water and insecticides and you should consider disposing of the plant. White flies lay tiny egg sacs on the underside of the leaves. Spider mites are hard to see but they leave a pattern of tiny yellow dots on the leaf. Scale leaves sooty mold. The soapy water gets rid of most of these insects unless they are heavily infected. Ms. O’Neil’s last suggestion was for those going on a winter vacation. She said it is best to put pots on a rack or a piece of oasis inside a larger bin. Put water in the bin but do not cover the bottom of the plant. The plants then benefit from the evaporation of the water and don’t need to be watered as often. Mr. Rader, a guest at the meeting, made an announcement that he has a greenhouse full of succulents and cacti that his late wife had collected. He made the offer that we could call for an appointment and have the plants for free or at a minimal cost. He was encouraged to return to a future meeting. The meeting was officially called to order at 8:25 p.m. Pam R. held a drawing for the potted houseplants and books that had been donated. The winners included Kathleen, Eileen, Bev, Penny, Nancy, Patti, Annette, Cathy, Pat B., Claire, Mary Anne S., & Pat W.
Patti S. announced the Holiday Party will be held during the December meeting. The event will be at her house and will be a time to relax and enjoy. Everyone has been asked to bring a home-made gift (value $15.00) and either an appetizer, a salad or a dessert. The Board of Gardeners will supply the main dish and the wine. The party will be at Patti’s house at 6:30 p.m.
Congratulations to all and Good Luck next year! The Hale Farm & Village project is underway. Linda L., Pam R., Mary Anne S., and Pat W. went to a meeting held at HF&V to learn about the techniques used in the mid-1800’s. We will be using holly & ivy in our wreaths or swags. Mary Anne suggested gathering red rose hips to add to these. Others suggested crab apples, winterberry, and red twig dogwood. We will meet in the Gatehouse Visitor Center at HF&V on Dec. 2 at 4 p.m. to construct our decorative items. Then we will meet again from 3-6 p.m. at the Salt Box House to install them. Some food and beverages will be served in the Gatehouse after the work is done. About 5-6 other garden clubs will also be decorating assigned houses. An e-mail reminder will be sent out closer to the date. Pam R. passed a sheet around to have people sign up to be a host for a meeting at their home. Another sheet passed was for members to suggest possible topics for speakers or ideas for field trips for next year. Linda L. said that she had been contacted by the Peninsula Garden Club to see if we knew of anyone in the area who would speak to their club about African violets. Nancy Seacrest’s name was mentioned and Linda will forward this to her contact. Claire P. presented the Treasurer’s Report. We currently have $2057.34 in our account. $1343.40 is restricted to HF&V and $664.25 is unrestricted. A few members still have to pay their dues. See enclosed report. A thank you note from Wendy Rybka was passed around. She graciously allowed us to tour her gardens earlier this summer. Pam R. announced the First Annual Steeplechase 8k Run to be held at Bath Community Center on Sat., Nov. 9. The course has hay bales, logs, and gates to be jumped over (or run around). Winners will get medals and all participants will get a t-shirt and a goody bag. Rachel will be running in it as will Claire’s husband. Linda L. motioned to adjourn the meeting at 9:15 p.m. Seconded and approved. The meeting was called to order at 7:05 p.m. Pam R. introduced speaker Vince Matlock, Master Gardener who presented information about Succession Gardening. Mr. Matlock spoke briefly about other gardeners that he admired, such as Jim Crockett from the television show, Victory Garden, Joe Kovach who advocates varying the heights of the plant rows which decreases bug problems, and Elliott Coleman of Maine who gardens in all seasons. He retired in 2010 and became a Master Gardener. Both he and his wife started selling their produce at local Farmers’ Markets in the Akron/Canton area. They are able to supply three different markets with a steady source of vegetables from their ½ acre lot that has been filled with over 100 ft of raised beds. These beds are usually made with 2x4’s and are laid out to be 2 ft wide by 8 ft long by 2 inches deep. He doesn’t remove the grass when he builds a bed but covers it with newspaper and then topsoil (4 inches) to fill the box. Mr. Matlock recommends not walking in the beds because that compacts them and not turning over the soil because that brings up weed seeds that may germinate. He protects his gardens by surrounding the area with a four foot high electric fence and a “scarecrow” that is activated by a motion sensor. Mr. Matlock said that we should “winterize” our gardens. This involves protecting and improving the soil and can be done by adding compost or cover crops and also adding a lime/sulfur/nitrate fertilizer. The ratio should be low, such as 5-4-5 or 3-3-3 and this should also be done again in the spring. He said he uses a cover crop of oil radishes (seeds from Johnny’s Seed Co.) and avoids compost when possible because grass cuttings that contain stronger fertilizers are usually a part of that. However, Sweet Peat is made from manure and is a good cover for the soil. Things like hoses and tools need to be stored away. He recommended cleaning pots, planters, and supports with a 10:1 spray of water and bleach. This helps kill organisms that might otherwise survive all winter. Mr. Matlock said that he uses succession planting because he wants to harvest his crops early and have them again later in the season. He utilizes crop rotation and “weather beaters” to help accomplish this goal. Weather beaters are things like cold frames, high and low tunnels, drip irrigation, and a greenhouse to start seeds. He plants the seeds at intervals so that when one crop is done, another is getting started to replace it. Another suggestion was to plant a fast growing vegetable next to a slow growing one. Produce such as garlic can be planted in the fall and harvested the following summer. Mr. Matlock then suggested that we visit his website, Matlockgarden.com. Patti S. started the business meeting at 8:30. Pam R. said she will find out if school groups visit Hale Farm & Village on Mondays and Tuesdays. If not, she will arrange a work day for us to be in our garden and send an e-mail to us. The HF&V Harvest Festival is going to be held on Oct. 13. We are not having volunteers there because of the Bath Nature Preserve Fall into Nature on Oct. 12. We will have a table and will help visitors make sachets. There will be a dedication of the Observation Deck over Bath Pond. The schedule for volunteers will be e-mailed to each of us. HF&V needs people to decorate the outside of the houses for Christmas. All materials must be natural and would have been available for residents in the 1830-1850 era. Pam has volunteered our group to decorate the Salt Box House. We can make wreaths for the door and swags for the fence. There will be a class from 4-6 p.m. on Oct. 7 to instruct people about what types of materials were available to the residents. Mary Anne S., Pam R., Linda L., and Pat W. will be attending. Eileen S. has some Civil War fabric that we might be able to use. We will aim to put the project together near the end of Nov. and install it on Dec. 2-3. Staff and visitors to the Candlelight Tour will be voting on their favorite house. On Dec. 29, there will be a Wine, Wassail & Cheese Party to give out the awards to the various groups. The staff hopes to generate a lot of interest in the community by having this event. Pam R. has also heard from the winners of the Wine & Cheese party that we will host in the HF&V gardens. They would like to have the party for 10 guests early next summer. Patti’s friend has indicated that he may be interested in speaking at the event by giving a short lecture on the wines chosen for that night. The field trip to the Cleveland Botanical Gardens was going to be held at the same time as their Herb Fair. However, that date is Oct. 12 that conflicts with the Fall into Nature event. Some discussion was held about a group going on a Wed. evening from 5:00-6:30 and then going out to dinner. However, no date was decided on. Carolyn B. has been chosen to give a speech to the Junior League of Akron on Monday, Oct. 21. She will talk about her sculptures and their environmental themes. Penny M. reminded us that the Bath in Bloom gardens tht we took over this year (post office & cemeteries) need to be weeded and dead-headed as part of the fall clean-up. We will work in the same teams that planted them. Next month’s meeting will be on Nov. 6. Dee Dee O’Neil will talk about houseplants. The meeting will probably be at the Town Hall. Watch for an e-mail. The meeting was adjourned at 8:53 p.m. The meeting was called to order at 7:40 p.m. by Pam R., following a wonderful tour of Nancy M’s beautiful gardens. Delicious treats were provided by Cathy P., Bev C., and Annette B. “Karen Barta suggested that the article written by Karen Barta for the new Bath-Richfield Times Magazine should go into our scrapbook.” Eileen S. moved to accept the minutes and Bev C. seconded the motion. No Treasurer’s Report was presented because the Treasurer is out of town. Our scheduled speaker, Master Gardener Lee Paulson, was unable to attend tonight’s meeting due to a family emergency. Pam R. suggested that we cover our business agenda first and then have an informal discussion regarding preparing our gardens for the winter and helpful hints that members might have. 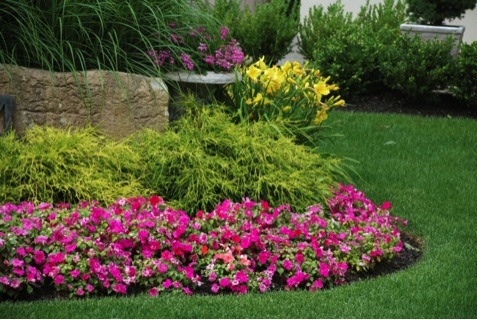 Pam R. hopes to take pictures of our plantings throughout the township. The plants have done well this year because of all of the rain. However, the geraniums, which are in many plantings, still needed extra water at times. Pat B. reported that the Made in Ohio event was held in august. The event had an admission price of $5.00 and was attended by 8000 people, up from last year. Pam R. reported that the annuals put into the Anniversary Garden in BCAC have done poorly. Members agreed that we should forego annuals and search for drought resistant perennials for this garden. Pam also reported that Hale Farm & Village is now only open on the weekends. We need to plan some workdays to deadhead and weed the gardens. We will also have to remove or transplant some of the more invasive plants, such as lemon balm, iris, etc. The Klingstone, which is used throughout Williamsburg, VA., still needs to be applied after there have been a few dry days. It is sprayed on top of the gravel that we have installed and keeps the gravel secure and also allows water to run through it. This makes the surface easier to navigate, especially for those with strollers or wheelchairs. She will order it from the supplier in N.C. and will check into the costs of hiring someone to spray it on. Members discussed adding more bulbs to the BCAC walk. Pam R. will contact Mike with the Township about the possibility of having him meet us and use an auger to dig the holes. Last year, 150 bulbs were planted by five members in about an hour with his assistance. She will set up a date to plant the bulbs and inform us by e-mail. Kelly Falcone-Hall of HF&V recently lost her mother who had brain cancer. Joan M. will send a sympathy card from the group. Pam R., Linda L., & Mary Ann S. have been working with other HF&V volunteers to write bylaws and start a group named Citizens of Hale. This group will be offered to those who are members of HF&V for an extra annual fee of $30.00. It will emphasize education, gardening techniques, arts & crafts, etc., and should be very interesting. HF&V will also be having a contest to decorate the houses for the holidays. Mary Ann S. volunteered our club to make wreaths and garlands out of natural products to decorate the front door and the fence around the Salt Box home. Fall into Nature will be held on October 12 at the Nature Preserve. Pam R. has the materials to construct spice sachets to be made again at our booth. The new observation deck will be completed and dedicated at the event. The Library has a story hour with Kodak, a dog who visits story time at the library frequently. Various food booths will also have treats for sale. Eileen S. reminded the group about the cancelled trip to Schhoepfle Gardens, near Vermilion, OH. She mentioned the beautiful surroundings, a merry-go-round, two antique stores, and an ice cream shop. Linda L. has been there and highly recommends it. Eileen suggested that the group make a field trip there this coming Sat., Sept. 7 and leave at 9:00 a.m. However, no one was available at this time. Everyone thanked Eileen for all of her time and efforts in providing fun and interesting field trips. Eileen S. also mentioned that Ohio Mart at Stan Hywett will be held in October. The cost for a ticket is $9.00 to attend the Mart and $15.00 to also go into the house. If anyone would like to get a group discount, let her know so she can buy ten tickets with one payment. Her friend, Elise Bennett (guest at the June meeting), plans on joining BGGC. Penny M., Pam R., and Mary Ann S. write the Plant of the Month articles and send those to Karen B. for publication in the Bath Country Journal and the Richfield Times. We discussed putting them on the Blog page of our web site. Joan M. suggested that pdf files be sent to her for posting. Penny also suggested that next year’s columns should focus on bulbs used throughout the seasons. Pam R. orders daffodil bulbs from Van Bourgondien catalog. She orders the Mary Eke, Arkel, and Camelot daffodils in groups of 25 each. She can order extra groups of 25 if anyone is interested. There was a motion to adjourn at 8:20 p.m.
Further discussion was then held regarding Ideas to Help Put Your Gardens to Bed. Karen B. stated that deer have been eating the second blooms off her knock-out roses. Kathy A. discussed digging up dahlia bulbs, cleaning them, and putting them into perlite and keep them in an airtight bucket. Other types of bulbs need to breathe and don’t need an airtight space. Linda L. really likes Preen and uses it in the spring and fall. She also uses Sweet Peet and chicken manure. Preen is a germinator preventer and should not be used in your vegetable garden. Sweet Peet is on sale for a good price at Dayton’s in the spring. Mary Ann S. brings her rosemary plant in for the winter and keeps it in the coldest part of her house. She also said that honey is one of the best rooting agents. You should cut a stem below where it branches out, put it in honey and then into potting soil. The plant roots quickly. Penny M. said that willow water also works well for rooting. Nancy M. said she has a cart that she attaches to her lawn tractor. This picks up the leaves and chops them, thus making a nice mulch to spread on her gardens in the fall. The meeting was held at Stone Cottage Farm & Gardens, which is owned and operated by Lorree Cummings, CCN, a nutritionist and organic gardener. She talked about classes that she gives on Healthy Eating, Raised Bed Gardening,, Urban Homesteading, and more. She then talked to us about Late Season Gardening and passed out three pages of information re: planting vegetables in midsummer. Lorree likes to use heirloom vegetable seed and often gets hers from the Seed Saver Exchange that she reports is economical and has quite a variety. Seeds should be kept in airtight jars out of sunlight to prolong the life of the seeds. Lorree recommends raised bed gardening because they are easy to create and maintain. 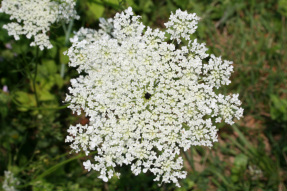 They can be very productive and easy to harvest and the soil stays looser because it is not compacted by foot traffic. The best location for such a bed is to orient it from east to west and have it somewhere that gets at least six hours of sun each day. The tallest plants should be planted on the north side of the box so that other plants aren’t growing in their shadow. Lorree recommends using 6 inch high cedar beams to create the beds, to amend the soil as desired, and to use an natural cypress mulch. She recommends putting the plants close together and to keep adding new plants when space opens up as others are harvested. Winter gardening is a good way to extend the growing season and is done by adding plastic tubing around the beds and then cover the tubing with Visqueen sheeting. This results in a temporary greenhouse to allow plants to keep growing. Lorree then provided a tour of her lovely, prolific gardens. The meeting was called to order at 8:35 by President Patti S. Pam R. reported that Community Day was a lot of fun and lots of hats were made. Attendance was down at the Community Day event. We made $36.00, which covered the expenses of the day. Unfortunately, the hypertufa troughs didn’t sell. We may try again at the Fall Into Nature event in Oct.
Pat B. reported that Stout’s will be having a class on making fairy gardens. The Anniversary Garden has lost several annuals, possibly from the excessive rain this summer. The gardens at the cemeteries and those associated with Town Hall are weeded as needed by the Township team. The Post Office garden is doing well and is much appreciated. Pam R. will try to organize a work day at Hale Farm to weed and deadhead in our gardens there. Eileen S. reported that the field trip to Sch0epfile Gardens was cancelled because of the weather. It may be rescheduled in Sept. The trip to the Cleveland Botanic Gardens may be changed to the first weekend in Oct. so that we can also attend the Herb Fair. Mary Anne K. said that Crown Point Ecology Center is having its annual Taste of the Earth Celebration 8/17/2013. She said there is also a Road Rally and Ice Cream Social at the School House on Sept. 8. There are several Farmer’s Markets in our area. The Made in Ohio Festival will be at HF&V soon. Our Wine & Cheese Party at HF&V, presented as a raffle prize earlier this summer, has not been scheduled yet by the winner of that prize. Rachel L. suggested that the article written by Kenneth Baldwin for the new Bath-Richfield Times Magazine should go into our scrapbook. Pam R. also suggested adding more pictures to the scrapbook. Bev C. moved to adjourn the meeting at 9:10. Our July Meeting was a picnic held at Hale Farm & Village. Storms were present throughout the afternoon & evening. Those who attended enjoyed the picnic inside the Main Visitor Center. A great time was had by all! 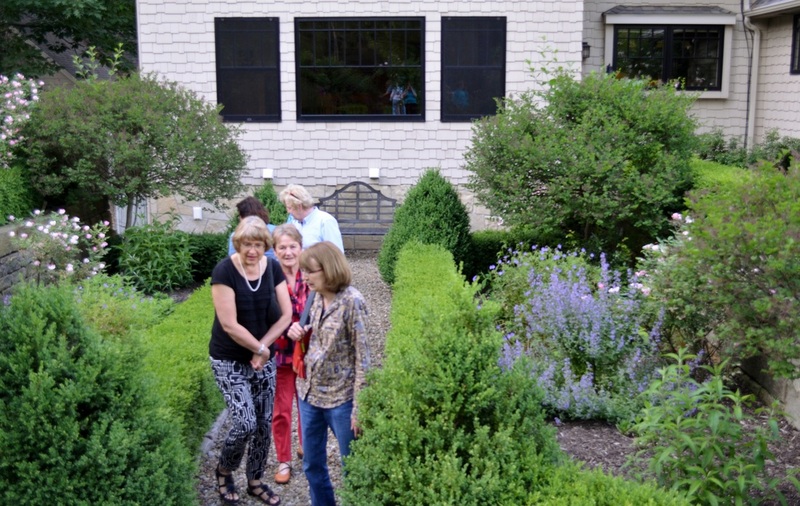 Everyone met at Wendy Rybka’s home in Peninsula for a tour of their lovely gardens. These included many theme gardens, such as a rose collection, organic vegetables, chickens and goats, and a hidden fairy garden. Many thanks go to the Rybka family for allowing us to view their garden. We then walked to Linda L’s home to view her extensive shade garden. The meeting was held there and was called to order at 8:34 p.m. Linda thanked all of us for helping out by planting sites in several Bath locations, including the post office and the many cemeteries. She said Rachel L. had a severe case of poison ivy after working at the E. Bath Cemetery. This site wasn’t finished because of this discovery. Eileen S. reported that there will be a trip to Rice’s Gardens and lunch at Gervasi’s on Sat., June 15. She also said that Mr. Eddy would run the Wacky Planter Booth at Bath Community Days this year but is looking for someone to take it over. Pam R. reported that the Hale Farm Legacy Benefit was a success. BGGC received many compliments about the garden. We have volunteered to provide a Wine & Cheese Party for 12 at Hale Farm & Village and this was offered as an auction item. The Whites of Shaker Heights won this item for about $300.00 and will be picking a date. The evening will be about 2 hours long and provide different wines & cheeses and members of the club to be available to discuss the garden and flowers in it. Patti S. knows someone who recently retired from a wine business and she will see if he is able to help with this event. Carolyn B. has a pop-up tent and Mary Anne K. and Linda L. have chairs to use for the evening. Pam also reported that on June 18, HF&V will hold a Conference of Living History Museums. People from museums all over the country will be visiting. On June 29-30, HF&V will hold a Home & Garden Tour. Volunteers are needed to be at the garden. Patti S. said that the Anniversary Garden will be planted tomorrow. Volunteers are needed. Yellow knock out roses are available at Loews if anyone is interested. The July meeting is on July 10 at 6:30. Our annual picnic that will be held at HF&V in the carriage shed. The Board of Gardeners will provide the main dish and members are to bring a salad or dessert and place settings. Wine is allowed and spouses are welcome. An e-mail will be sent as a reminder. The Following meeting will be on August 7 at 7:00. This will be held at Stone Cottage Farm & Garden at 2580 Northampton Rd. The owner will discuss raising chickens, raised bed gardening, organic gardening, canning, and urban homesteading. Pat B. reminded everyone that there will be a free concert in Fri., June 21 at the Bath Community & Activity Center. People are encouraged to bring picnics and enjoy the music of Tony Fortunato and Travis Haddock. All are welcome! Carolyn B. moved that the meeting be adjourned at 9:10 p.m. In attendance: Pat Witmer, Mary Ann Krejci, Linda Littler, Annette Brady, Carolyn Balogh, Nancy Mazar, Karen Barta, Rachel Luther, Pam Reitz, Patti Sinar, Beverly Cinovec, Eileen Simon, Cathy Parker, Pat Barb, Mary Ann Slattery, Tina Siniawski, & Joan Marsh. Thank you to Mary Ann Slattery for opening her lovely home and gardens to us! We all enjoyed an evening walking through her beautiful gardens before the meeting started. Mary Ann & her husband later opened the garage and mixed up the materials needed to make our hypertufas. Patti S. called the meeting to order at 7:10 p.m. She announced that Barb Hale and Andrea Fostvedt have resigned. Our Public Seminar was discussed with everyone agreeing that Cynthia Druckenbrod was an excellent speaker. Unfortunately, there were conflicts with two other groups who had events on the same evening and most of our attendees were club members. The date of next year’s Public Seminar will be re-evaluated. Pam R. reported that on April 6, the Club members and husbands laid new logs around the circumference of the Hale Farm & Village Herb Garden. Quince bushes were planted in the snow that fell on April 20. Next Wednesday, May 8, gravel will be delivered around 4:00. We will be working there to spread the gravel and put topsoil on the outside of the logs. She will make a list of the herbs that need to be replaced. Sweet peat also needs to be spread. A reminder e-mail will be sent to all members.. There will be future work dates because the HF&V Legacy Benefit will be held in a tent on the green oval on May 18. Pam will put up the banner with the Club name and possibly have a table display of the garden over the past few years. Bath Community Center daffodils are looking beautiful, as are the forsythia. A discussion was held to consider making a sign, directing visitors to view the area. This would then be displayed for two weeks each spring. Township regulations may not allow a permanent sign to be erected. Linda L. reminded everyone that planting of the Administration Building, the Veteran’s Memorial and 5 cemeteries is scheduled to be done between May 20-May 22. Each group can pick up their plans, plants, Preen & fertilizer at the Township garage and plant them at their convenience. The work must be done before the BVS Home Tour, May 23. The Anniversary Garden will probably be done after that date. Watch for information on the web site. Mary Anne S. discussed Bath Home Days and the Wacky Funky Planter Contest that has been run by Rosemary & John Eddy. Rosemary recently passed away and John needs to have someone take over the Contest. Advertising needs to be done and a judge needs to be chosen. Mary Anne will call Angela, head of the Home Days Committee, to see if they would handle this part. Cathy P. and Mary Anne K. agreed to have someone sit at the booth on the first Saturday in August. Karen B. said the deadline for submitting items to the Bath Country Journal & West Side Leader is the 15th of the month prior. There is a new magazine that just issued its first copy this week. She will find out the deadline for that too. Penny M. & Mary Anne S. write the Plant of the Month for the BCJ & WSL. Discussed possibly updating our blog site by publishing these columns. The meeting was adjourned at 7:50 p.m. The members then enjoyed making hypertufa containers to be sold at future public events. Again, many thanks to Mary Anne S. and her husband for preparing all of the materials needed and allowing us to use their garage for this activity!! Our annual public seminar was held at the Bath Township Hall on March 17, 2013. The meeting was called to order by Patti Sinar at 7:08 p.m. Pam Reitz then introduced Cynthia Druckenbrod, the Director of Horticulture at the Cleveland Botanical Gardens. Cynthia presented a thorough overview of plants that add great beauty to our fall landscapes. She first discussed several perennials and presented pictures of each plant. She continued by listing many shrubs and trees that would grow well in our area. Ms. Druckenbrod was a very well-versed and entertaining speaker who kept her audience very involved. For further information about the plants that were discussed, please see the Blossom Blog. The seminar was followed by our Annual Raffle. Thank you to the many club members and local businesses that contributed gifts that were grouped with similar items in baskets. In all, twenty-five baskets were raffled off. Patti S. called the April meeting to order at 7:08. Thank you to Kathy A., Pam R., and Patti S. for the wonderful snacks that they provided. The flavors this month were mangoes, lemons, coconut, asparagus, watercress, scallions & chives. What a wonderful assortment of treats were presented! Our speakers this month, Marty Murphy and Merrill Owen, are members of Friends of Yellowcreek. Dr. Murphy described what a watershed is and its importance to the surrounding area. He said that problems stem from point source pollution, such as industrial pipes that dump material into the water, and other non-point sources, such as fertilizers, which run into the water. The phosphates and nitrates in the pollutants are a favorite of cyano bacteria that produce neurotoxins that ultimately kill fish. Other non-point sources include malfunctioning septic beds, oil from automobiles, salt on pavements, and plastic bags, toys, etc., all of which get washed into the river after rains. Erosion and floods also take their toll by changing the shape and depth of the rivers. As development of an area increases, the amount of impervious surfaces (paved areas) increases. The Yellowcreek area has 15%-20% of the surrounding areas covered with impervious surfaces. Historically, problems start to increase after this number exceeds 20%. Friends of Yellowcreek is promoting Project Re-Leaf. Several hand-outs were circulated with information about this initiative and other ways to help preserve this watershed. The emphasis should be on protecting and replacing tree cover, especially around the rivers. Areas need to be repaired with more plantings of trees, shrubs, and grasses. These will help slow the flow of ground water and also filter it. Native plants are recommended. Another suggestion was to develop rain gardens by digging a small area at a low spot in your yard. Make sure the soil drains well within 48 hours. Use water from your downspouts, rain barrels, or other collection devices. This allows you to be creative with plants that need wetter areas to grow. Sandy Barbric of Summit Soil & Water will come out to test your area, give advice and provide a source for plants if desired. Following the presentation, Mary Anne S. discussed the upcoming May 1st meeting. Our project will be to make hypertufas. She will let us know what we need to bring so please watch the web site for this information. Mary Anne said we will need to supply two molds for our planters so that we can make one for ourselves and one to be sold at a future BGGC event. She suggested bringing the plastic planters that pansies are sold in, large containers from buying spinach or salad, large bowls, etc. We should plan on wearing grubby clothes because we will be working with a cement mixture. If possible, please bring plastic gloves and dust masks. Bottle caps from prescription bottles (to cut drainage holes) would also be helpful. 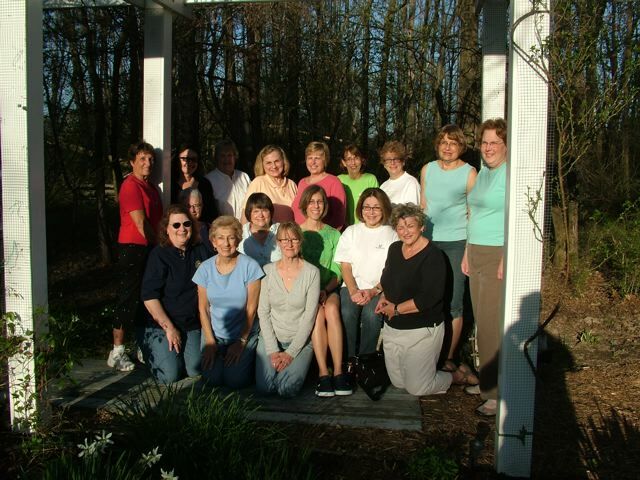 Pam R. reminded us that our first workday at Hale Farm & Village will be this Saturday, April 6. Jason from HF&V will be removing the old perimeter logs around the garden and we will be replacing them with treated 6x6 lumber. Clingstone will be put down on a future work date to make the paths more easily accessible for strollers, wheelchairs, etc. Work will start at 10:00 a.m. and all husbands are welcome! Future work dates for HF&V will be starting on April 20. We will be planting quince & forsythia, and spreading Clingstone. There will be a day scheduled in May to plant perennials before the annual Tent On The Green event (5/18) and one before the June Tour of Houses to weed and freshen up the garden. Please watch the web site for dates & times. Linda L. said that Bath In Bloom is no longer in existence but that they are buying the plants that they would normally plant at the cemeteries and the Post Office. BGGC will take on these plantings this year and will then assess if this is feasible for a long-term commitment. Members are being assigned to six small teams that will be contacted in May. The plants will be available on May 20 at the Town Hall and need to be planted by May 22. This will be done right before the Bath Volunteers for Service Home Tour. These planting assignments will also include our Anniversary Garden and the plantings around the Town Hall and at the Cleveland-Massillon/Bath Rd. intersection. Patti S. reminded us that the Raffle is in two weeks on April 17 at 7 p.m. at the Town Hall. Many interesting items were brought in and will be grouped together in baskets to be raffled off. Some of the gifts that were donated include gift certificates from Constantine’s, Flower Hutch, and the Bake Shop in Bath, a rain barrel, an Adirondack chair constructed by Jay L., and a basket with a membership to HF&V. Other gifts are still coming in. Posters have been placed throughout the community, such as at the Post Office, the Bake Shop, the Pet Loft, and the Library. Raffle tickets will cost $1.00 per ticket, $5.00 for 6 tickets, and $10.00 for 12 tickets. This is our major fund-raiser of the year so all are encouraged to attend and to bring friends and family. There will be a session to put baskets together and set-up for the Raffle starting at 6 p.m. on Tues., April 16 at the Town Hall. Cathy P. is accepting annual dues for Claire P. in her absence. Rose K. then presented a review of the web site. She said that on the web site, when a name is in red, you can roll your mouse over it and the email address will appear. The only names in red on the public pages have been assigned the BGGC email address (bathgammagardenclub@gmail.com). This needs to be checked regularly and currently, Pam R. is doing that on a daily basis and forwarding messages as necessary. Password protection is provided for the Members page. Please call one of the Club officers if you do not have our password. The information on this page includes the roster with embedded email addresses, inactive honorary members, past presidents, the monthly minutes, upcoming meetings with dates, time, and place, and upcoming field trips, projects and community support events with dates, times, and place. Please check these pages regularly. The Blossom Blog is open for web site visitors and is where you will find the Plant of the Month. Comments can be left on any Blog postings. However, if you wish to start a new item for the Blog, please contact one of the On-Line Committee members for help getting started. The meeting was adjourned at 9:57 p.m. In attendance: Karen Barta, Rachel Luther, Mary Ann Krejci, Lynn Barber, Carolyn Balogh, Claire Purdy, Linda Littler, Bev Cinovec, Nancy Mazak, Eileen Simon, Cathy Parker, Patti Sinar, & Joan Marsh. The first meeting of the 2013 Season was called to order by Patti S. at 7:12. Delicious refreshments were provided by Linda L., Eileen S., & Carolyn B.
Claire P. presented the Treasurer's report. The current balance in the savings account is $2,606.00. $1,700.00 is earmarked for the Hale Farm gardens which leaves $857.00 for general expenses. We are still waiting for $858.00 from the Bath Volunteers for Service (BVS) grant which was used to put in the water system at Hale. Cathy P. presented a detailed introduction to our new web site. It is accessed by using this address: www.gardenclubbathohio.org. She reviewed each page and everyone seemed very pleased with the site. On the Meeting Page, there had been a link to a poster but this linked to an incorrect page, which listed our password. Cathy then removed this link. She also found that links to some individual names showed their e-mail addresses. These were changed to bathgammagardenclub@gmail.com. Discussions centered on the Members page and possibly displaying the e-mail addresses, along with home addresses & phone numbers but no conclusion was reached. Other questions involved the opportunity for members to add pictures. Someone suggested using Snapfish or Shutterfly or a link through Sam's Club that would make it easy to display pictures. The schedule for the year was reviewed and heartily approved. Linda L. announced that Bath In Bloom has disbanded, due to the general ages of the members. They have always planted annuals at the Post Office and in the cemeteries. The club has some residual funds and have offered them to us in exchange for our taking on all of their plantings. Linda said that she has picked 5 people to lead teams (herself, Bev C., Karen B., Nancy A. & Mary Ann S.). These teams will have 2-3 people on each one and will be responsible for establishing these gardens on May 20-22, before the BVS Home Tour 5/23. Flowers will be purchased & stored in the Township garage so that each team can pick them up for planting at a mutually agreeable time. The new gardens, the Anniversary Garden, & the the Township Administration Buildings will be included in this effort. Hale Farm will continue to be a club project and will have separate work dates assigned. A Buddy List is available on the web site. Discussions were also held re: skipping the Bags & Bonnets event this year and a joint effort during the April 3 meeting to make baskets for the Raffle. Consensus indicated that members preferred to keep the baskets small, rather than one large one, and to encourage related items to be donated which would be raffled off. More people would be winners then. Carolyn B. had a nice article written about her in this month's Bath Country Journal and Richfield Times. She said her tree is on permanent display at Malabar Farms State Park. The meeting was adjourned at 8:27. Present were: Carolyn Balogh, Bev Cinovec, Mary Anne Krejci, Linda Littler, Cathy Parker, Pam Reitz, Eileen Simon, Patti Sinar, Mary Ann Slattery, Pat Barb. Judy Hamilton from the Precocious Dandelion conducted a workshop showing us how to make Holiday wreaths. President Mary Anne K. called the meeting to order at 8:36 pm. Minutes of the August, September and October meetings were approved. Treasurer’s Report: The Club has a balance of $2761.66. Pam R. circulated a sign-up sheet for Hostesses, Program ideas, projects, and field trips suggestions for the upcoming year. The Club will plant bulbs at the Bath Community Activity Center this coming Saturday from 9:30 to 11:30. All members are encouraged to help plant. Cathy P. moved to accept the slate of Officers; Carolyn B. seconded. The motion was passed. It was recommended to make the following changes to the By-Laws: Section II – G – to add On-Line Communication Chair to maintain the Club’s website and on-line communications. The Secretary position will be amended to include handling all correspondence including thank you, Sunshine and Member recognition. Bev. C. moved to accept these changes to the By-Laws; Linda L. seconded. The Motion was passed. The Holiday Party will take place at Fairlawn Country Club. The cost is $25. A cash Bar will be available. Carolyn B. was approached by a Boy Scout who is working on his Eagle Badge. We discussed ways in which he could help the club with any projects. Hale Farm project was identified as a possibility. Stan Hywet is having a Floral arrangement contest. Do we want to participate? The meeting was adjourned at 9:06 pm. Enjoy a guided walking tour of the Cleveland Botanical Gardens. Members will stroll through the various garden areas such as the Herb Garden, Rose Garden, Kitchen Inspiration Garden, Japanese Garden and Restorative Garden. Our docent will share tips on sustainable gardening. We will conclude the evening with dinner in Little Italy. CARPOOL at 4:30 We will carpool from the Bath Township Memorial Park parking area. This meeting is open to the public and includes Bath Gamma Garden Club's Annual Raffle in support of our community gardens. Some of the exciting prizes include a handmade Adirondack chair, a rain barrel, and a variety of specialty themed baskets. Local merchants, suppliers and members have donated these gifts, so be sure to come! Raffle tickets will be on sale before and during the meeting from club members. Tickets are 6 for $5 or 12 for $10. Doors open at 6:30 pm. Time to pay your annual dues! GARDEN QUOTE: "Winds undulate while snowflakes accumulate! So cold it's hard to believe, but we'll be relieved, Spring has sunshine up her sleeve. And tho we are wary, we know snow is temporary! Queen Anne’s Lace yields a lovely light yellow dye. Our first 2014 meeting is at 7:00 on March 19 at Hale Farm's Visitor Center. Our speaker is Becky Monegan of the Medina Spinning, Weaving and Dying Guild. This will be her 30th year of volunteering at Hale. Becky will tell us about which local plants can be used as natural dyes. We welcome new and returning members. If you are interested in learning about gardening, want to volunteer in garden-related community projects and make new gardening buddies, please join us on March 19. FOR YOUR TO-DO LIST: At the March meeting, be sure to pay your annual dues, buy raffle tickets (to keep or re-sell) and pick up some flyers about the April meeting to hang in public places). Also, you can download the poster to email to friends or print and hand out. 2013 WAS A GREAT YEAR OF ACCOMPLISHMENTS! Plans for Bath Gamma programs are underway. You can learn more at the Events and Members tabs or the March meeting.